Baby shower word scrambles are a fun baby shower game that will have your guests racing to see who can unscramble the baby and pregnancy-related words first. The baby shower word scramble puzzles below are all free and can be printed within minutes. You'll have an almost instant party activity that takes no preparation. The list is organized into baby shower word scrambles that are more geared towards boys, ones that are all covered in pink, and then a set of neutral word scrambles that would work for any baby shower. These baby shower words scrambles are great for a shower celebrating a baby boy. You'll find lots of blue and boy-themed word scrambles here. Blue Dots Scramble: This shower word scramble has a cute blue-and-brown design and twenty words to unscramble. Light Blue Theme: Besides the free baby shower word scramble, you'll also find several other free printables for your light blue-themed baby shower. Mustache Theme: Here's a baby shower word scramble that's themed for a mustache baby shower. There are also matching celebrity baby names and what's in your purse games. You'll find a baby shower words scramble here that is perfect for a girl's baby shower. Pink Dots Scramble: Brown and pink dots and hearts decorate this free, printable baby shower word scramble. Soft Toy Theme: Here's a stuffed animal and flowers-themed word scramble that would be perfect for a little girl's shower. These baby shower word scrambles work for showers that are celebrating the upcoming arrival of a boy, girl, or unknown gender. You'll find neutral designs for word scrambles that are available in both blue and pink colors. Multi-Color Options: This baby shower word scramble is available in blue, pink, and yellow. Boy or Girl Baby Scramble: There's a pink and blue version available of this baby shower word scramble. Disney Character Scramble Game: This is a great word scramble if you're planning to have a Disney-themed baby shower or even if the mom just loves some of these movies. Nautical Baby Theme: Here's a blue and red nautical themed baby shower word scramble with an included answer sheet. You'll also find several other matching baby shower games in this PDF file. 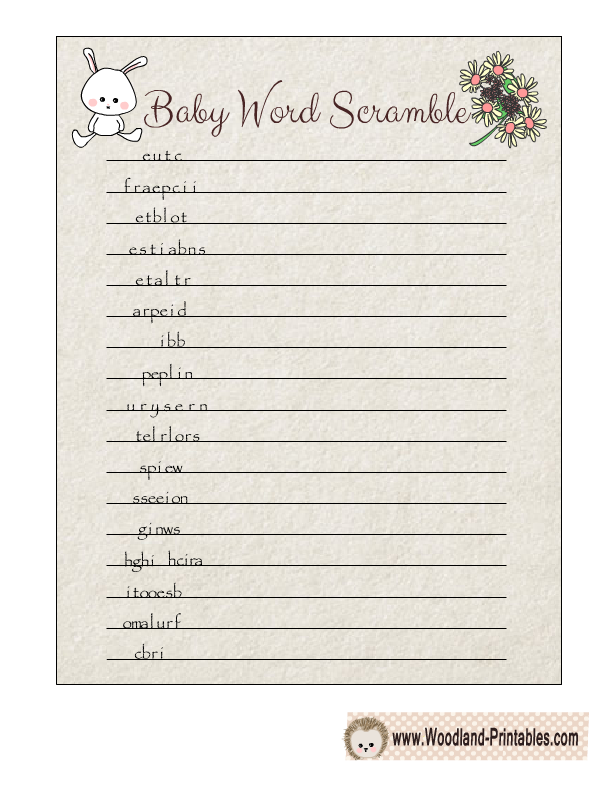 Baby Babble Game: Print out this baby shower word scramble game four per page. Black and White Scramble: A simple black and white baby shower word scramble complete with instructions and an answer key. Colorful Theme: A colorful baby shower word scramble with twenty phrases to unscramble. Colorful Pink or Blue Game Cards: Here are some adorable word scramble game cards available in both pink and blue. Purple Font Word Scramble: A baby shower word scramble game that includes words about babies, pregnancy, and gifts. Gender Neutral Baby Babble: A huge baby word scramble that includes almost thirty words to unscramble. Colorful Animals Theme: Unscramble 20 baby-related words in five minutes. Who can do it the fastest? Multi-Colored Option Printables: Get three different baby shower word scramble printables in blue, pink, or green. Twins-Themed Baby Babble: Choose from 6 different color combinations for this baby shower word scramble made especially for someone expecting twins.